The Palestinian citizens in the 1948 occupied lands held their Friday prayers at Al-Qassam cemetery in Balad Al-Sheikh village, east of Haifa city, to commemorate the anniversary of the massacre which had been committed in the village by the Zionist gangs of Palmach and Haganah. Sheik Ra'ed Salah, head of the Islamic Movement in the 1948 occupied lands, delivered the Friday Khutba (sermon) and led the prayers in the presence of political and national figures. Sheikh Salah highlighted the atrocities that had been committed by the Palmach and Haganah gangs in the village, especially the massacre that claimed the lives of more than 60 Palestinian villagers on December 31, 1947. 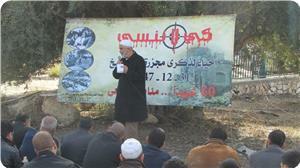 Sheikh Salah also talked about the role needed to protect the Palestinian land and homes in the occupied territories. "We protect our land not to preserve it for ourselves, but because it is a common right belonging to the whole Muslim nation. This is our holy land, the land of Jerusalem and the Aqsa Mosque, and we must make efforts commensurate with its stature," he stated.